Ticker Sense: Analyst Coverage: Do They Really Know More? Actually you should be harping on Citigroup. I can't imagine how an analyst can continue to recommend a stock and at the same time be reducing the price targets so drastically. It boggles the mind. 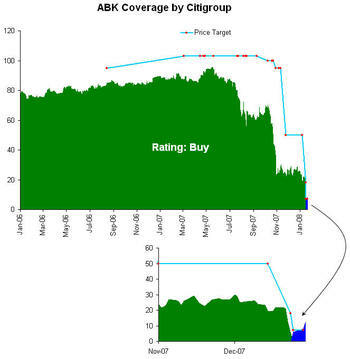 Citi is not alone with regard to ABK. We also got this wrong although we updated in a more timely fashion in 11/2007 and updated again in 01/2008. including news bulletin in upper right hand corner. The saga surrounding ABK is far from over as their primary basic business model is very lucrative. Everyone, including Buffett wants to eat their lunch! Disclosure: Opinion of CrossProfit analyst reflecting the CrossProfit consensus. There are two kinds of investors, be they large or small: those who don’t know where the market is headed, and those who don’t know that they don’t know. Then again, there is a third type of investor –the investment professional, who indeed knows that he or she doesn’t know, but whose livelihood depends upon appearing to know.